Whether you're moving in, moving out, or just want to brighten up your home. Pro-Painters delivers excellent work, completed on time and on budget with guaranteed customer satisfaction. A Kelowna based, family-owned and operated business specializing in residential painting since 1989, Pro-Painters boasts a staff of expert craftsmen offering professional, experienced painting services. All of our painters are trained, licenced, insured, and WCB approved. Painting services for a range of exterior surfaces including stucco, siding, wood and composite plank. A variety of paint types and application techniques for best results. Trade equipment and trained experts. Skilled surface preparation and custom finishes. Painting services for doors, garages, sheds, decking, fencing and other features. Interior Painting: The Final Touch. High-grade paint for easy cleaning, durability, and enduring quality. Meticulously rendered surfaces painted with attention to detail. A safe, spotless, organized work environment. Professional staff, bonded for your assurance. Professional interior and exterior Kelowna painters; we pay attention to the smallest of details. Our skilled home and exterior home painting and commercial painting teams are trained to ensure that we start and complete your project on time with minimal disruption. With over 20 years of experience, we have the expertise to provide solutions to the most challenging painting problems whether they are interior, exterior, residential or commercial. 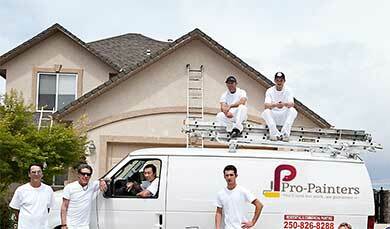 Pro-Painters proudly serves Kelowna, West Kelowna, Vernon, Penticton, and other Okanagan communities. Family operations also in Surrey and Seattle. 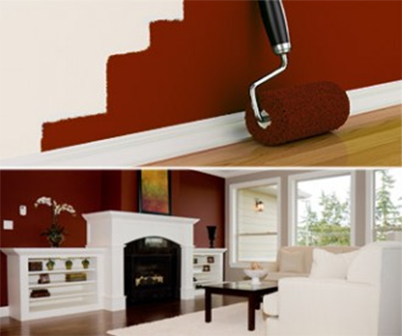 Pro-Painters are professional painting contractors who specialize in residential and commercial painting projects. Pro-Painters are based in Kelowna, B.C., and provide exterior and interior painting servicves throughout the Okanagan. Copyright © 2019 Pro Painters LTD.